While you’re in Hanoi, why not spice up your stay with some delicious local specialties, street food, and Vietnamese coffee? After all, eating local food is the only way to really get to know a place! Small alleys crammed with food stalls, delicious smells filling the air of the quaint Old Town streets and imposing monuments honoring Vietnam’s rich and turbulent history— all that and more is Hanoi. If you are planning a short trip here and want to see all the main attractions, this two-day itinerary of the capital is perfect for you. And while you’re here, why not spice up your stay with some delicious local specialties, street food, and Vietnamese coffee? After all, eating local food is the only way to really get to know a place! A trip to Hanoi would be incomplete without a leisurely stroll around the city’s famed Old Quarter. This is the historical and commercial center of the city and dates back to when it was originally founded around 1,000 years ago. It’s also a great place to stay if you want to be close to all the awesome sights, restaurants, and coffee shops we’re highlighting here. 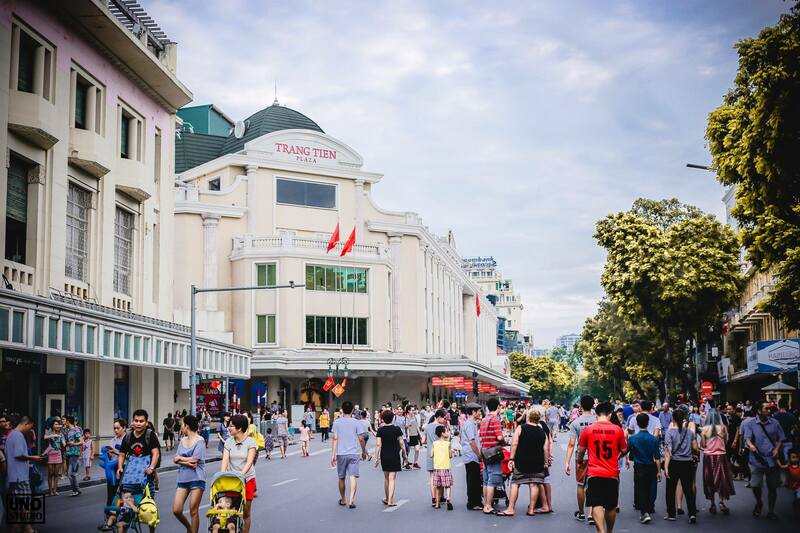 For more ideas on where to stay in Hanoi, check out our article that lists the 10 Ten Choices for Accommodation or see Christina’s newly launched apartments in Hanoi’s modern and convenient Lancaster building. Rise early (around six or seven) to get a glimpse of locals going about their daily morning chores, like their parents and maybe even grandparents did before them. When you’re there in the early morning hours, you’ll witness street food vendors setting up their stalls and preparing for the day, as well as people on their way to work stopping for a quick breakfast or a cup of the strong, aromatic Vietnamese coffee. Maybe you need one of those yourself if you actually made it out of the hotel by 6:00 AM. While officially the Old Quarter is only made up of 16 streets, the endless number of tiny lanes and alleyways adds countless nooks and crannies to this place. Streets are named after the goods or services on offer there, so after a few steps, try and guess what it is. The best way to explore all these little streets? Wander around, get lost, and take in the endless flow of sights and sounds, beautiful colonial architecture, tiny mom and pop stores and quaint Buddhist pagodas that make this area so unmistakable. While strolling around the labyrinth that is the Old Quarter, you will most likely be overwhelmed with the choices of delicious foods. The best thing to do is try a little bit of everything to make sure you experience the full variety of Hanoi’s street food. But now, back to today’s breakfast… A true specialty in Hanoi is Xoi Xeo. 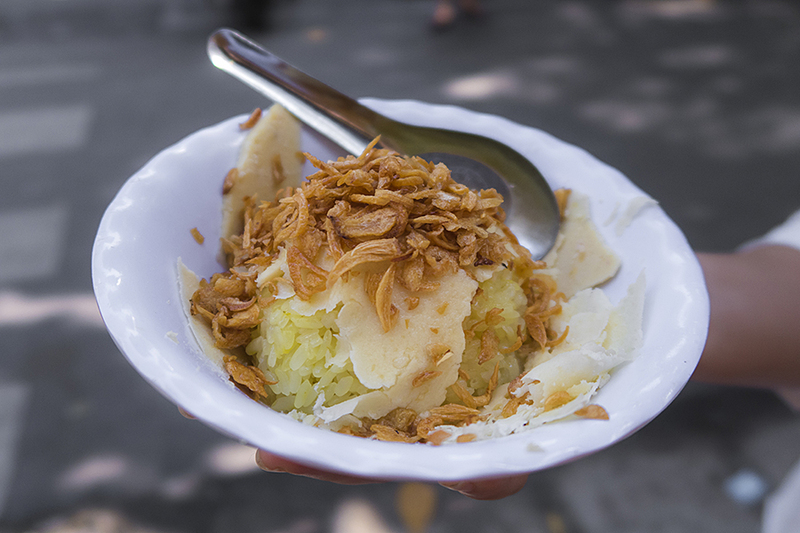 This staple is made of sweet sticky rice served with a variety of toppings such as green mung bean paste, fried crispy shallots, and soy sauce. If you’re really hungry, you can add pâté, boiled chicken, pork belly or eggs to make it more savory and filling. Head to Xoi Yen at 35B Nguyen Huu Huan st. for your morning serving of Xoi Xeo and wash it down with some Tra Da (homemade iced tea) or a cup of strong Vietnamese coffee. Where to get coffee? You’re in luck, there’s a great place called Cong Cafe right next door at 35A Nguyen Huu Huan st. While Xoi Xeo is absolutely delicious, try not to fill up on it because there are so many other things to try. Banh Goi for example. This fried dumpling is made of light rice paper stuffed with a mix of vermicelli noodles, minced pork, mushrooms, and a blend of spices. Banh Goi is served with a sweet and sour dipping sauce that’s often a homemade concoction of fish sauce, garlic, chili, sugar, and lime juice. It tastes great just with this sauce or even wrapped in a lettuce leaf and fresh coriander for extra flavor. There are several great places to get Banh Goi in the Old Quarter, for example at Xoi Yen and especially at 52 Ly Quoc Su for the best. It opens around 10 AM so you’ll have plenty of time to work up an appetite before you go there. On the northern edge of the Old Quarter, you will come across Dong Xuan Market. Here you can find pretty much everything you never knew you wanted and probably even a bit more. Spread out over four floors, vendors sell everything from fresh colorful produce, exotic spices, meats, and cooked dishes to knock-off t-shirts, cheap sunglasses, luggage, school uniforms, tourist trinkets, and household goods. Looking for a souvenir? You have good chances of finding it here. While the building itself is not particularly impressive and some visitors might even describe the market as dirty or unappealing, going there is an experience in itself. If you get there early enough, you can observe entertaining scenes of merchants setting up their stands, haggling about prices or simply catching up with each other over a bowl of steaming pho or a cup of freshly brewed coffee. Even if you don’t want to buy anything, the bustling, colorful atmosphere of Dong Xuan Market makes it worth a visit. Now that you’ve eaten well, it’s time to go explore some more. Leaving the tiny streets and endless rows of shops behind you, head over to Hoan Kiem Lake. While Hanoi’s streets and restaurants are bustling from the early morning, this area is a place of peace and calm in the midst of this frenetic city. If you get there early enough, you will see people go for runs or gather for a class of Tai Chi to start the day. It’s worth it to take your time here (and walk off that breakfast) to experience this very different side of Hanoi. After a short walk, you will come across Ngoc Son Pagoda, an ancient building set in the middle of the lake and built to honor the military leader Tran Hung Dao. It also commemorates the legend of a Vietnamese emperor who is said to have used an enchanted sword to beat the Chinese Ming Dynasty, which he then returned to Hoan Kiem Lake (Lake of the Returned Sword) and the Golden Turtle God. 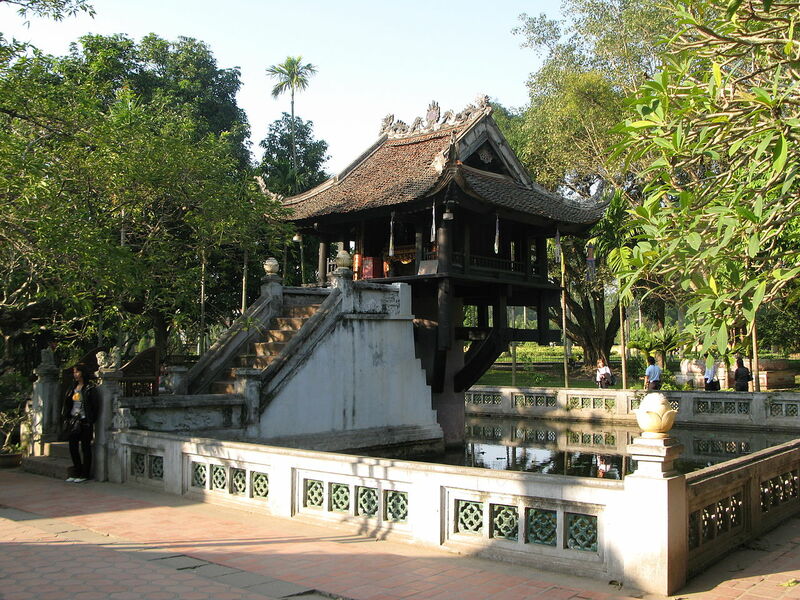 The pagoda can be reached via an ornamental, red wooden bridge with a small entrance fee. It’s worth it, as inside the temple you’ll see some interesting historical artifacts, as well as a giant turtle (it weighs over 250kg) that was found in the lake. Even today there are turtles living in the lake, so try to spot one as it’s considered a sign of good luck! After enjoying the peace and tranquility of Hoan Kiem Lake, head past St. Joseph’s Cathedral, a beautiful church built during French colonial times, to Hoa Lo Prison. 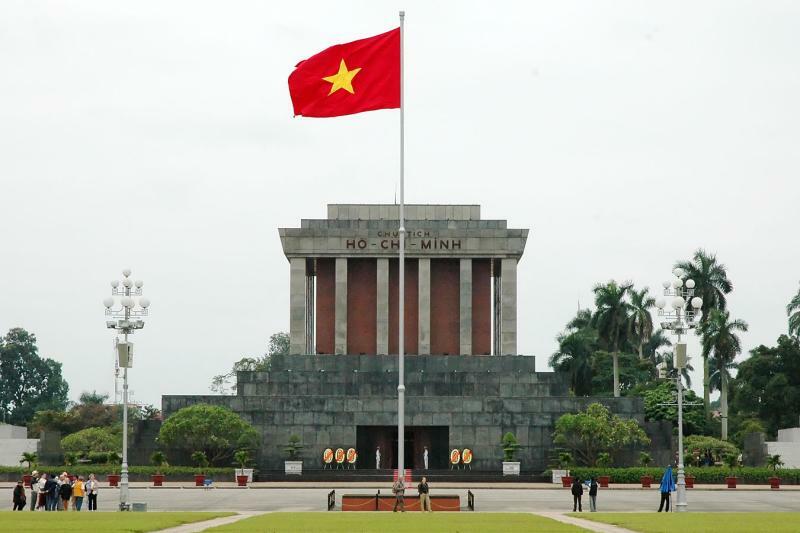 It was built during French rule and was originally intended to lock up Vietnamese revolutionaries. A guillotine from this time is a silent reminder of the harsh punishments prisoners suffered for breaking the rules of the French colonial government. Today Hoa Lo prison is more well-known for housing hundreds of American prisoners of war after the Vietnam War. Visitors can see artifacts collected from these prisoners and read some of their stories. If you’re interested in learning more about the war, the Hanoi Hilton as it was nicknamed by the American prisoners, is a great sight to see. It will bring the story of well-known war veterans such as former presidential candidate John McCain to life in a whole new way. After all this walking, it’s time for lunch. You will probably have worked up quite an appetite by now, so pay careful attention to the great dishes we outline below. Start off with Banh Cuon, a cake made of minced meat rolled in a steamed rice flower sheet. It has a very mild taste and can be eaten with a flavorful dipping sauce to give it a stronger taste. A great place to find Banh Cuon is at Banh Cuon Gia Truyen at 14 Hang Ga Street in the Old Quarter or at countless other stalls around the city. Walk a few more steps to 67 Duong Thanh Street to find Bun Cha Nem Cua Be Dac Kim, a great place to have Nem Cua Be, fried crab rolls. These rice paper pockets are stuffed chock-full of minced crab, pork, mushroom, and spices, making for an unforgettable combination of flavors. Generally, it’s served with fresh lettuce leaves and herbs as well as with nuoc chamdipping sauce. Now that you’ve had your starters, find yourself a stall that sells Bun Thang, a rice vermicelli noodle dish with chicken, egg, pork, and around 20 (yes, 20!) other ingredients including dried shrimp, squid, spring onion, coriander, ginger, mushrooms, beets, fish sauce, sugar, and vinegar. Be sure to have your camera ready as this dish is usually prepared quite beautifully. After this long leisurely lunch break, make your way to Thang Long Water Puppet Theater. This is something you don’t want to miss as it plays a significant part in Vietnamese heritage and culture. That being said, you can imagine this show being very popular among both international guests and locals. This means that performances often sell out several days in advance so try either booking ahead or as soon as you get to Hanoi. Once you’re at the Theater, lean back and enjoy watching the delicate puppets dance across the water enacting tales of Vietnamese history and mythology. The show is one hour long and is made up of 17 short skits that are accompanied by traditional musical instruments such as drums, wooden bells, horns, bamboo flutes, and cymbals. Hopefully, you’re hungry after the water puppet show because there are two more things you should absolutely try today. The first dish is Cha Ca, Hanoi’s most famous delicacy that you absolutely cannot miss. Cha Ca is white fish patty, seasoned with fresh dill, turmeric, garlic, and ginger and presented in a sizzling pan. Along with that, you will be served rice noodles, peanuts, onions, chili, and nuoc cham sauce. Mix everything together for the real Cha Caexperience! Finding this dish in Hanoi is easy. In the Old Quarter, there is an entire street named after it and as you can imagine, it’s full of restaurants serving this dish. Another good restaurant for Cha Ca is Cha Ca Thang Long in Duong Thanh Street, also in the Old Quarter. They are famous for masterfully preparing this delicacy and will only leave you wanting more of it. If you still have room for one more yummy thing to try, the Mien Xao Luon at Dong Thinh Nha Hang Mien Luon in 87 Hang Dieu is the dish to get. This food’s main ingredient is eel which is used to make a flavorful broth as well as crispy toppings for the stir-fried glass noodles it comes with. Other condiments include bean sprouts, egg, fried shallots, cucumber slices, and the obligatory shaved banana blossom and fresh herbs. Never had eel before? Then it’s about time! The Vietnamese love their beer and the country’s vibrant craft beer scene proves it. If you want a great place to enjoy a couple of cold ones after your long day of eating and walking, Legend Beer is the obvious choice. They brew their own beer and, since they’re on a 3rd-floor rooftop terrace, they offer awesome views of the busy roads around Hoan Kiem Lake. While beer is a bit more expensive here than in most other places in the Old Quarter, you will probably find some unique varieties that make it worthwhile to check out. And don’t forget the serious people (and crazy traffic) watching you can do from the terrace… it’s priceless. After getting up so early yesterday, you might want to take it a bit easier on day two. Start the day slowly with a tasty noodle dish for breakfast to get your energy levels up before heading out. 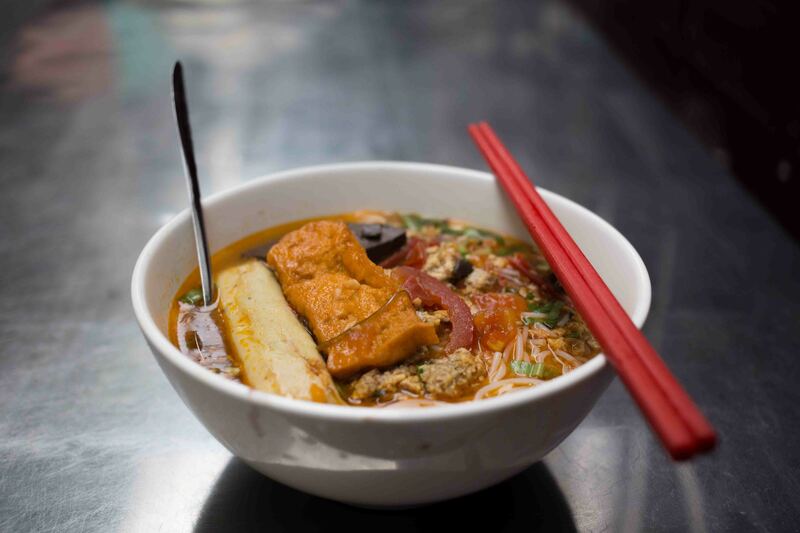 You have several options here, but two that you probably haven’t tried yet are Bun Rieu, rice noodles in tomato broth and Pho Ha Noi, the local version of Vietnam’s national dish. 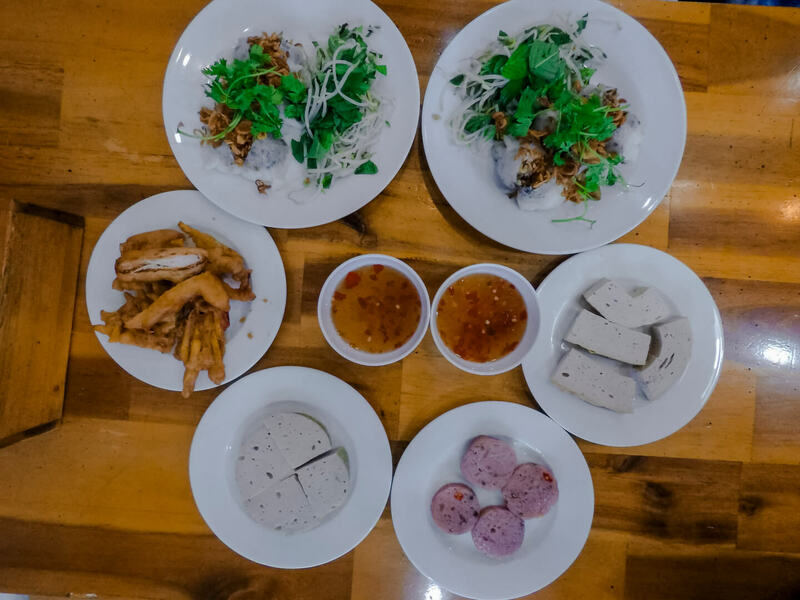 There are plenty of great restaurants and food stalls all around Hanoi serving these two staples and each of them has a slightly different way of preparing their dishes. One thing they all have in common though: the broth is rich in flavor from all the fresh herbs, spices, vegetables, and meat used to prepare it, making these soups a great, nourishing start to another long day of exploring and sightseeing. As with all local food, pick a place where you see locals gathering for their breakfast and it will be nothing short of amazing. After you’ve had your breakfast, catch a taxi to the Mausoleum of Ho Chi Minh. This huge granite complex in the middle of Ba Dinh Square should absolutely be part of your itinerary as it represents a big part of Vietnam’s history and culture. Inside, in a glass case, lies the embalmed body of Ho Chi Minh, or Uncle Ho as he is lovingly called by many Vietnamese people to this day. It is important to note that you need to dress respectfully, so no sleeveless shirts, short skirts, and the like. Since Ho Chi Minh’s remains are sent to Russia for maintenance every year around October, the Mausoleum is closed for a while in autumn. Before you go, check online or with your hotel to see if it’s open to avoid disappointment. Even if it’s closed, it’s still impressive to see from the outside and the museum next door is absolutely worth a visit as it gives you in-depth information about Vietnam’s most popular leader, his life, work, and philosophy. Getting hungry? Then a plate of Pho Xao is just what you need now! At 13 Lo Duc in Hai Ba Trung District, not too far from the Mausoleum and museum you will find Pho Thin, a small family-run place that offers Pho Xao, the dry or stir-fried version of the popular Pho noodle soup. It’s prepared with sliced beef, leafy greens, onions, and of course the typical rice noodles that are fried until they’re crispy on the outside and soft and chewy on the inside. If you’re over the noodle dishes or simply want to try something a bit more out there, here’s something for you: Chim Quay or barbecued pigeon. For Chim Quay, a whole pigeon is deliciously seasoned and then barbecued until the skin becomes crisp and golden. Get Nom Chim Quay if you want your pigeon served on a bed of fresh lettuce, roasted onions, carrots, and papaya. That will add a wonderful element of flavor and freshness to the dish. Chim Quay Bit Tet at 20 Hang Giay Street is a great place to try this dish but if you don’t feel like going all the way back to the Old Quarter for lunch, there are other places that serve it too. Located in the beautiful park right between the Ho Chi Minh Mausoleum and the museum, you can do this one before lunch if you still have the energy for it and your belly isn’t growling yet. Alternatively, come back to the park after your lunch for a digestive walk in the serene gardens and a visit to this iconic pagoda. Originally built between the years 1028 and 1054 by Emperor Ly Thai Tong, it is one of the oldest and most revered pagodas in Hanoi. A legend says that the Emperor originally built the pagoda after having a dream about being given a baby son who was resting on a lotus blossom. This is why the pagoda is often compared to a lotus flower growing out of a pond on a single strong stem. Step inside and you will see a richly decorated effigy of the Buddhist goddess Quan Am, also known as the Goddess of Mercy. The tiny, 3-square meter interior is beautifully adorned and still an important place of worship and prayer. When coming here, please dress respectfully (no shorts or sleeveless shirts). After visiting the pagoda, take a walk around the expansive park. It’s a welcome change from the busy, noisy streets of Hanoi and there are plenty of other things to see and explore there, like Ho Chi Minh’s stilt house where he lived between 1958 and 1969. While you’re strolling around the park or heading to the next stop, the Temple of Literature, get energized with some Vietnamese coffee. There are countless places around Hanoi that serve this delicious, fragrant brew hot, on ice, black, or with condensed milk, so you won’t have to look for long. Vietnam’s coffee culture is known around the world and it’s something you absolutely have to experience while you’re here. There are so many ways to do that, so no matter if you love classy, high-end places, cool hipster cafes, or the typical roadside stall with tiny plastic chairs, Vietnam, and Hanoi, in particular, has got you covered. Cafe Lam at 60 Nguyen Huu Huan Street in the Old Quarter offers the typical experience of tiny plastic stools on the sidewalk, letting you get up close and personal with Hanoi street life while you sip on your coffee. Giang Café at 39 Nguyễn Huu Huan Street in Hoan Kiem District serves the local specialty: egg coffee. Don’t worry, there will not be a raw egg swimming in your cup. It’s more like a rich, creamy custard served with coffee – a must-try if you’re serious about your coffee. Hanoi Social Club at 6 Ngo Hoi Vu Street in Hoan Kiem District feels like a cozy living room and makes for a welcome break from the city’s constant rush and raucous streets. Chill out here for a while, enjoy the AC and take advantage of their free Wi-Fi. Loading T Cafe is on the 2nd floor on 8 Chan Cam Street in Hoan Kiem District and features a cool, contemporary design with warm brick walls and comfortable seats to relax in after doing a lot of walking in the city’s heat. This is just a tiny list of the seemingly endless supply of wonderful coffee shops in the city. Sometimes the best thing to do is just wander the streets or explore a side alley and you’ll be sure to run into several unique and unforgettable places all serving amazing coffee creations. There are also some well-known chains that you will probably have noticed such as Phuc Long and Highlands. But to have the real experience, individual coffee shops are way more fun to visit and at the same time, you are supporting a family-run business! Once you’re fresh and energized from your coffee break, head to the Temple of Literature. While its name suggests that this is a religious place, it was actually the first University in Vietnam and is dedicated to Confucius and other famous scholars and teachers. Built around 1070, this place is a stunning monument to higher education and research and is full of historical artifacts and rich ornaments from the Ly and Tran dynasties. 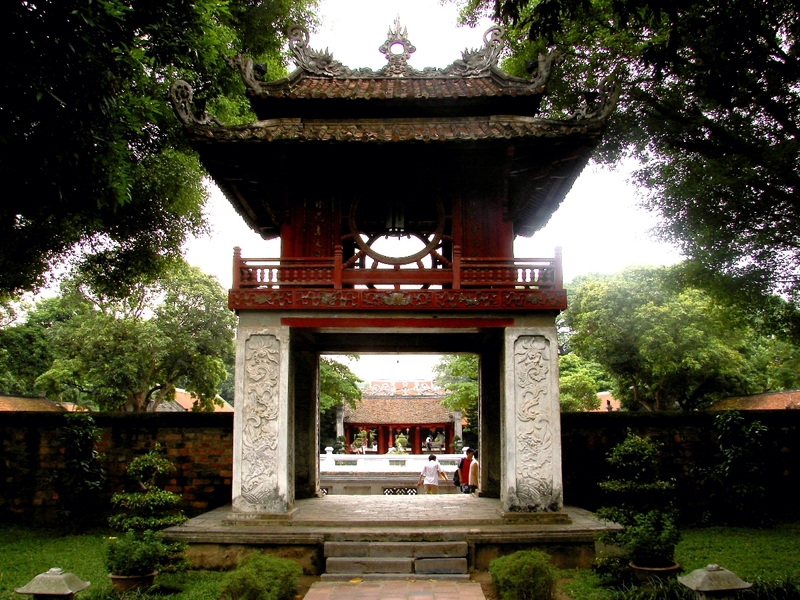 The Temple of Literature is home to five courtyards, two of which house wonderfully landscaped gardens. A large, serene pond known as the Well of Heavenly Clarity is in the third courtyard and a statue of Confucius and a house of ceremonies is in the fourth. In the fifth courtyard, you’ll find Thai Hoc, a large bell tower, and drum which are both of key importance in Vietnamese history and culture. Meander through the beautiful grounds and let this place take you back in time, to when ancient scholars came to the gardens to relax, and only the children of royalty and aristocrats were educated here. Last Dinner in Hanoi: What Was Your Favorite Dish So Far? Hanoi’s food scene offers so many options that it seems almost impossible to try everything in only two days. But out of the dishes you’ve tasted, which ones did you like best? The crispy Pho Xeo or the aromatic Cha Ca? Whichever it is, tonight might be a good chance to get another taste of it before you head off to your next destination and have to start trying new local specialties all over again. After dinner, it’s time for another night out on the town. Since Hanoi is quite famous for its great bars and clubs, you have plenty of places to choose from. 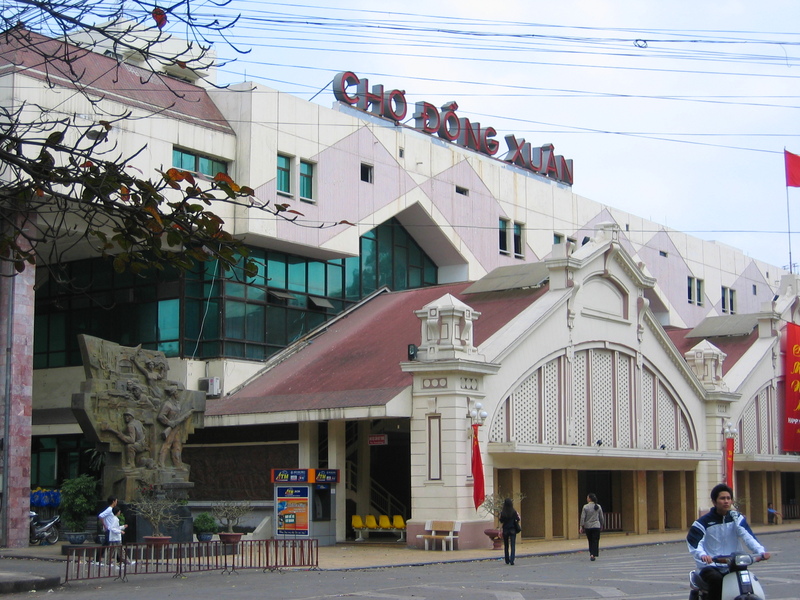 A great one to start is Bia Hoi Junction at the crossroads of Ta Hien and Pho Luong Ngoc Quyen. There, countless stalls are set up after dark every night and crowd the sidewalks with endless rows of plastic chairs and tiny folding tables. Here you’ll meet locals and foreigners alike, starting their night off with a cold beer or two. If you feel like more of a party after that, head over to Dragonfly Bar and Lounge at 15 Hang Buom, in Hoan Kiem District. There you’ll find a mixed crowd of locals, expats, and travelers, dancing the night away in a fun, relaxed atmosphere. Drinks are fairly inexpensive here with liquor and mixers starting at as little as 70,000 VND. Looking for a nightclub to head to next? Check out Infinity at 45 Hang Bai Street. There, local DJs play everything from Hip Hop and House to EDM and electro and you can dance to your heart’s content on the spacious floor. Drinks are reasonably priced here as well and you’re likely to make some Vietnamese friends as this place is hugely popular with the hip 20-somethings of Hanoi. 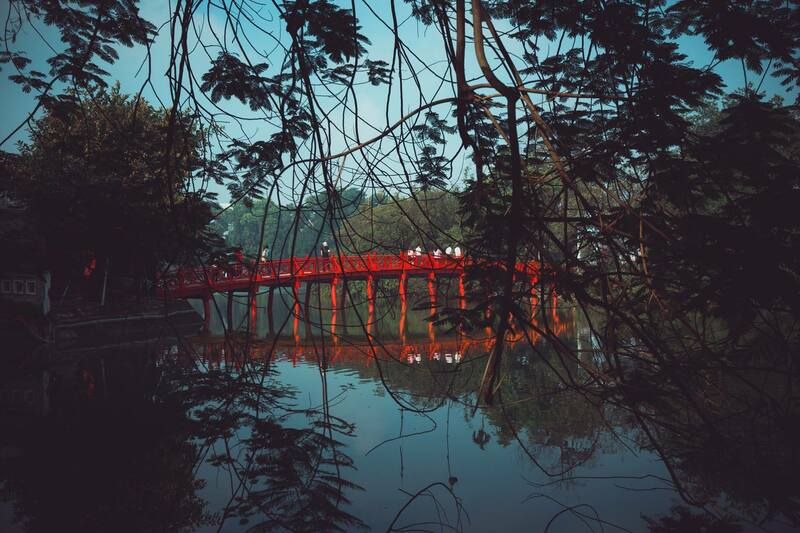 Inspired for your trip to Hanoi? If your stomach is growling and your wanderlust is sparked, book your flights and a place to stay now so you can experience Vietnam’s amazing capital with all the ancient cultural landmarks, historical sights, and delicious treats it has to offer! If you have more than 2 days in Hanoi, you should also hop over to our article about socially responsible traveling in Hanoi, which details places such as herbal baths and restaurants that support the local community.